Dressed in traditional charro suits and wearing our well-known sombreros, we play our original musical instruments, such as violins, vihuelas and guitarróns, and of course, we also sing the songs which are associated with them, in every German city and internationally as well. We interpret boleros, sones, cha-cha-chá, cumbia and many other music genres from Mexico to Tierra del Fuego with the passion and feeling of our Latin American musical heritage. We play at festivals, parties and events in hotels and at exhibitions in Frankfurt, Berlin, Hamburg, Hannover, Munich, Cologne, Dortmund and of course wherever you want to be entertained by us. We are well-known and popular throughout Berlin, and we are also welcome at family celebrations everywhere. 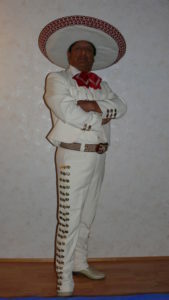 Mariachi Musicians for Your Event! 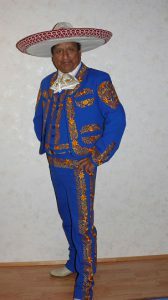 You can book Mariachi Sol Latino. We can adapt ourselves to your needs and wishes. For big occasions, we expand our group by adding some additional musicians – then we can strike up the music with an extra violin and two trumpets. 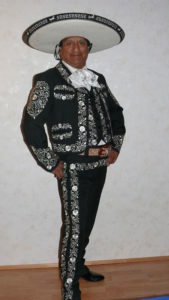 Mariachis are an inherent part of Mexican folklore. Our songs are very emotional, convey a lot of happiness, but also a lot of melancholy, just like the character of Mexicans. We are proud, spirited musicians who recount love, desire, passion and a zest for life in our songs. 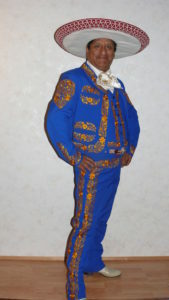 Hits such as “Besame Mucho” and “Guantanamera” are just a small part of our extensive repertoire.